A young friend came over to my home to create a cute springtime craft!This is what you will need for this cute project. Kids will love to make this!!!! I purchased the following at the Walmart…love that store! We put some styrofoam in the pot to have something to stick the ears, sign, etc into. We then glued the green plastic grass in the pot. Next we drew some pink for inside the ears, and copied it onto the pink felt.We glued the pink onto the front of 2 ears. We took one of the plain ears, placed the thin wire around the edge of the ear and added hot glue on top of it. We quickly took the front ear (with the pink), and placed on top of wired piece. Repeat with other ear. I made two 2 long U shapes with the same wire and glued to the bottom of inside ears. 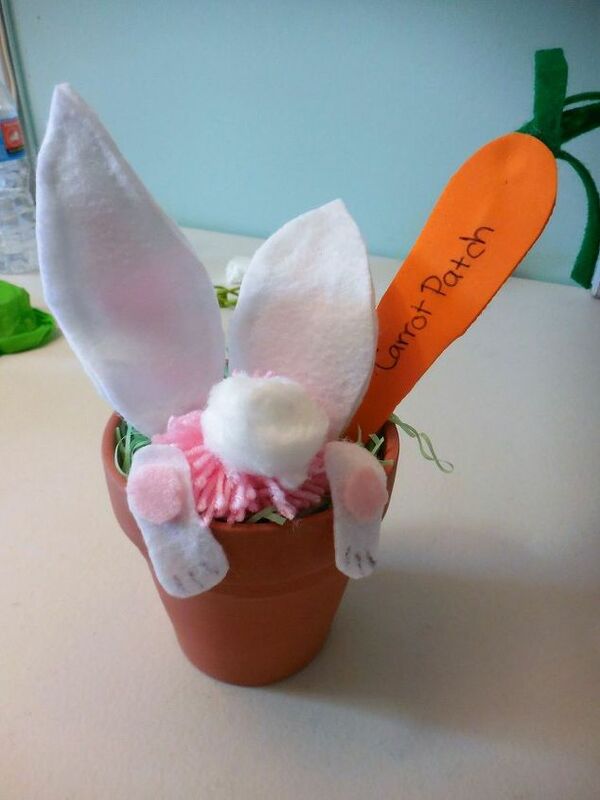 Look at those cute ears…..and we made a sign, in shape of a carrot, with orange foam paper and wrote ‘carrot patch’ on it. With the green felt she cut the carrot top and glued on carrot. We made the same U wire and glued onto carrot and stuck it in the pot,into the styrofoam to hold securely. She cut out the bunnies feet with the white and added pink for the pad. We glued them to the to rim of the pot by the bunnies bottom. Isn’t this adorable….Such a fun and easy project for kids!! If you make one…would love to see!!! This is adorable! A great craft to do with the kids! Absolutely Lisa! I had so much fun with Mariah! I love having kids over to learn new crafts!! Fun day! Thank you! It was pretty easy! Kids love crafting! I would love to….but…she took it home!! Thank you so much Yolanda, it was fun!!! You are to sweet and just as gifted!!!! TYSM too!!!! Adorable, I just had so much creating with her!!! How are you doing??? Surfs Up! Thank you so much!!! We had so much fun creating this! Jennifer, this was such a fun little project! Just love that little bunny!